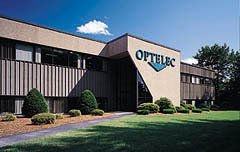 Optelec was established in 1985 with a goal to develop high quality video magnifiers for the millions of visually impaired people in the USA and Canada. The success achieved over the past years resulted in Optelec being acquired in 1997 by the Tieman Group, based in Holland. Tieman is a manufacturer and distributor of video magnifiers and Braille products. Today, through its holdings of Optelec, Optelec Canada, and HumanWare (another affiliate which distributes Tieman products in the USA), Tieman is the worldwide leader in the specialized market of products for the visually impaired. The Tieman Group and Optelec are committed to providing product solutions of the highest quality to meet the needs of consumers with non-correctable vision impairments. We aim to help them improve their daily lives and maintain their independence and productivity. Optelec is a developer of Low vision and Video Magnifier vision aids for people who suffer from cataracts, glaucoma, diabetic retinopathy, and macular degeneration. �1999 Optelec U.S., Inc. All Rights Reserved.